Anybody had experience with using f.lux alongside MSI True Color? With MSI True Color, you'll also be able to tweak with display colors, color temperature, and blablabla. Although from the looks of it, it also has a profile called Anti-Blue which seems to produce similar effects as f.lux. So yeah, I was wondering whether anybody here had experience in using both at the same time. Or should I just use the Anti-Blue profile in night? FYI, I bought this MSI notebook recently. Last time I used an Acer notebook with no fancy color app, so I had been using flux in there for a while. So yeah, I'm kinda curious as to whether it'll still work without issue alongside MSI True Color. @BobbyWibowo I doubt it, but wow that's nice! I wonder what GPU and motherboard combination they are using. Could you find that for me! My best advice is, try it to see what happens. My guess is that you won't run into any problems. @Tungsten_smooth I'm pretty sure MSI notebooks use custom motherboards by MSI themselves. My notebook is MSI GE62 6QD Apache Pro. For the motherboard, it uses MSI MS-16J5 (http://www.userbenchmark.com/System/MSI-MS-16J5/19321). For your information, mine uses GTX 960M 2GB. @TwoCables Yeah, I will soon. 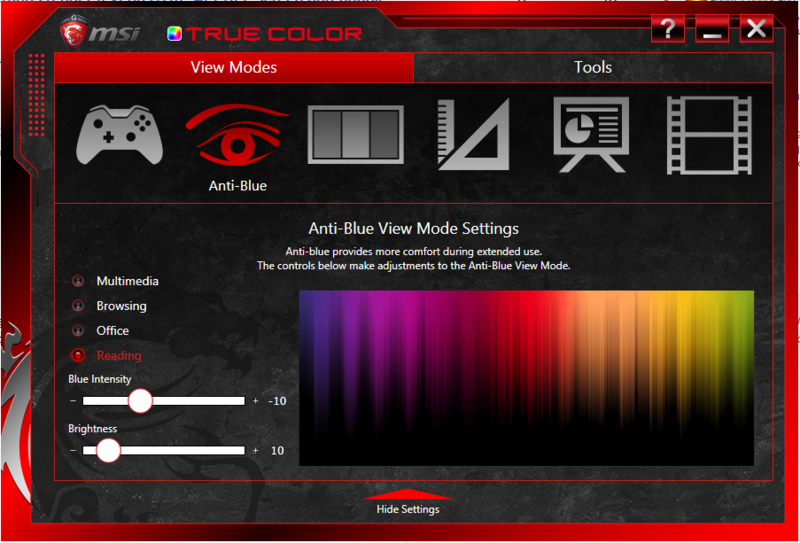 With MSI True Color app, there's no automatic switch based on time. So i figured that even if the anti-blue profile works similar as flux, it'll still be a pain to change it every evening and return it back every morning. So, I've tried installing flux. From the looks of it, both app keeps overwriting each other color scheme. Or at the very least, MSI True Color does. @BobbyWibowo yeah my initial impression was it would adjust colors in the same way as adjusting AMD / Nvidia / Intel control panel settings. It works great, but it's not automated and it won't stick as well. MSI True Color will always remember last used color profile and reapply it on boot (the app will need to be allowed to start on boot, obviously). So, well.. I suppose I'm more than satisfied with this. The Anti-Blue profile is working well enough to replace flux as it has 4 different options (as you can see in the screenshot).